i can't even begin to tell you how good church was this morning. AND we were early! i love that feeling. i want more of that feeling. Feb. is not only black history month, but it's the month of love <3 . our pastor is currently preaching through a series titled Tying The Knot: How To Make A Marriage That Lasts and i've been soaking up all that good info week after week. it applies to unmarried couples as well. i urge you to give it a listen! i put on my sassy shorts for our walk to the park today. aren't these adorbs!? i had to have them cause they were a whopping 19 bucks, yall. IKR! there are so many patterns and colors to choose from; i listed a few below for ya. here's dessert! i always use a little organic buttery spread (1 tbsp) + coconut oil (2 tsp) in my pan. make sure your pan is on low-medium heat; they burn cook crazy fast. happiness is..... sitting outside on the porch with a bowl of pan-fried plantains. here's to another great week, fit friends! WORK HARD AND BE KIND! THAT IS ALL. i usually don't eat/drink much of anything besides coffee before teaching HIIT, so we had lunch at the Lifetime Cafe before heading out cause ya girl was hoongry. i refueled with a mediterranean egg white wrap and roasted carrots. so filling! kids get hunger attitudes just like we do (if not worse) so we all chowed down. this is why i take breakfast so important now that Chiso is in school! he can't leave the house without it. later that evening i met up with my hubby, sis-in-love, and a few more friends and family to support my bro-in-love, Brian! he cleaned UP and won 1st place NPC Physique Open AND NPC Physique Novice. biiiig congrats to him; what a huge win for the 6 Pack USA team! after church sunday, we finally headed to see the big tree at the Houston Galleria. Sonny doesn't fancy the word 'tradition' but this is one i'd like to keep going...forever! we actually had family pictures scheduled but the rain killed our plans....again. this is our last week and chance to take them...ugh. i have our outfits laid out and everything :( . wish us luck, ha! i can't even deal. 4? no way. the best out of 87. enough of this. let's go eat. for dinner, we went to a place recommended by a friend and client, Frances! True Food Kitchen did not disappoint. their menu is comprised of the anti-inflammatory food pyramid. my body definitely appreciated that! love this concept and cannot wait to try out...the rest of the menu. i started with their kale-aid. then, Sonny and i split their edamame dumplings per Frances' suggestion. they made us anticipate our entreès that much more. do you see those perfectly cooked shrimp? *kisses finger tips* BELLISSIMO!!! the Panang Curry was THE STUFF. i usually don't do dairy-based/creamy sauces and/or soups but uuuuuh, the description sounded too good to resist. i was impressed and elated to report that i did not even bloat afterwards! awesome. Sonny requested half chicken & half shrimp with his, so i told our waiter i wanted the exact same thang. pizza for the boys! well, just one boy. Dego was knocked out the entire time, so i fed him at home. after we went to Pink Berry, lol. both of our phones were dead by that point, so no fro-yo pics, womp. my bowl looked a lil' somethin' like this though! stole this pic from our maui 8th wedding anni trip. Q: fit friends! what else is good at True Food Kitchen!? i ran into a friend of mine (owner and CEO of Inner Me Studios, Nicole Phillips) while there and she ordered quinoa pancakes which were NOT on the lunch menu... so of course i looked at her plate like 'what are thoooooose????' bwhahahaha. have you tried this place? and another one! would you LOOK at this girl!? 4 weeks postpartum and new mommy Kara is looking fantabulous! i am so proud of my sister! she remained active for the bulk of her pregnancy and is now reaping those fit pregnancy benefits. i got to watch my niece, baby Natalie, for the first time last week while Kara tended to some court business with her clients. Baby Natalie is THE sweetest lil' thing! look at that face! what a pleasure and an honor to be able to return the favor and watch baby Natalie for my sis & bro-in-law. if you are a preggo or postpartum mom that needs help getting back on track, email me: le@fitfoodiele.com. my fave music apps are Spotify and recently the Pandora app. i get my cardio in a couple of times a week and yall know i don't mind it at all! ONLY if i have my Beats headphones. silent cardio is the worst, right?! anyway, here are 20 songs i'm feeling that help speed up my fat burning sesh. no judgement! oh and radio version preferably. check out this morning's motivational Periscope and have a blessed tuesday, friends! Q: add to my list! what song(s) gets you through your workouts? fall is basically here and it's back to school time, parents! we are all busy. we are all often scrambling to get ourselves and our kids together and out the door in the mornings. been there! actually i'm there every day. now that Chiso has started preschool (no tears from either of us, yay), i make sure he is focused and ready to learn before he leaves the house. how? some brefus! yes, breakfast. it's incredibly important for everybody, so don't downplay it or sweep it under the rug. statistics don't lie, peeps. easy, to-go options in the form of healthy carbs are the way to go, not unhealthy, sugary, prepackaged, instant, frozen junk. they need good, wholesome, nutrient dense foods that their bodies recognize so they can perform at their very best. start this with your kiddos NOW! they will only get busier and busier as each year passes; by the time they are teens and beyond breakfast will be second nature (and hopefully non-negotiable). parents, we must send our babies off right and set them up for success. if ya follow my blog or my Insta account then you'd already know how much Chiso (4 yrs) despises all vegetables. however, he still loves oatmeal something serious! so when this very special delivery hit our doorstep, Chiso went BANANAS and could not wait to crack it open. 'yummy oatmeal, mommy!!!' 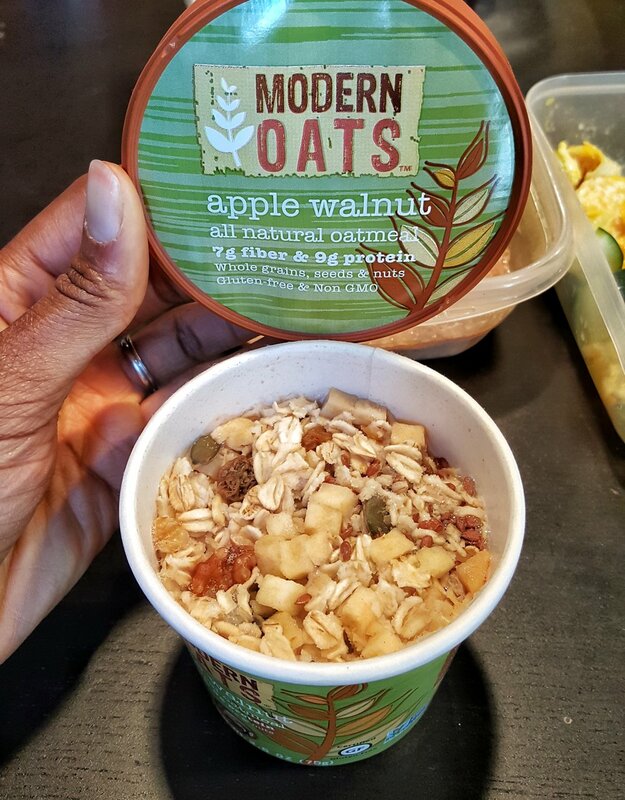 yep, Modern Oats was officially in the building. look at all the pretty colors and tasty flavor combos! Chiso is nowhere near as indecisive as i am and chose 5 berry immediately. there's an oatmeal cookie recipe on the back of the carton that i'm totally going to try! anyway, if you don't/can't whip out a pot to boil water, then don't. and in 3 minutes you've got a nutritious, power-packed, start to your busy day. my kids ate it ALL! toddler tested, fit mom approved. i whipped up the apple walnut flavor for Dego. there were chunks of apple, flax seeds, pumpkin seeds, raisins and walnuts in each bite.... delish. aaaand i ate my brekky right along side them. so exciting. lol. if you haven't seen my IG posts, my wedding anniversary is coming up and my hubby hasn't told me exactly what we're doing, but that i should pack a bikini!!!!! so, i wanted to tighten up a lil' bit these last few weeks and get serious with my nutrition. sure i eat oat bran and egg whites every morning anyway, but i miss being able to snack in moderation (quest bars, arctic zero, wheat thins, goldfish crackers, fig bars, dark chocolate covered raisins, kettle corn) whenever i please! maintenance mode (concerning my calorie intake / body fat percentage) is fun and where i belong right now, but i just want to bring my best package to the beach, hahaha. 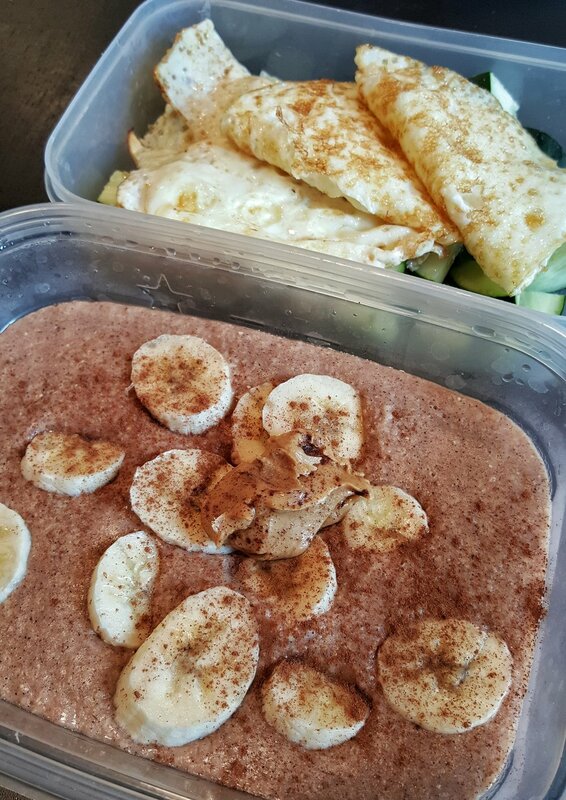 master trainer and 1/3 of the 6 Pack USA team, Brian Egwuatu quickly drew up a customized meal and workout plan for me that has got me wondering if i ever want to compete in a bikini competition again LOL! it's been 3 years or so of not having this many restrictions, but hey, the more change you desire, the more restrictions you must make. it is what it is. plus i'm working on an outrageous 2 week timeline so just know ya girl is over here STRUGGLIN' for the cause! once we are done frolicking and celebrating i will happily return to maintenance beast mode. i HATE leg extensions!!!!!!!! that is all. 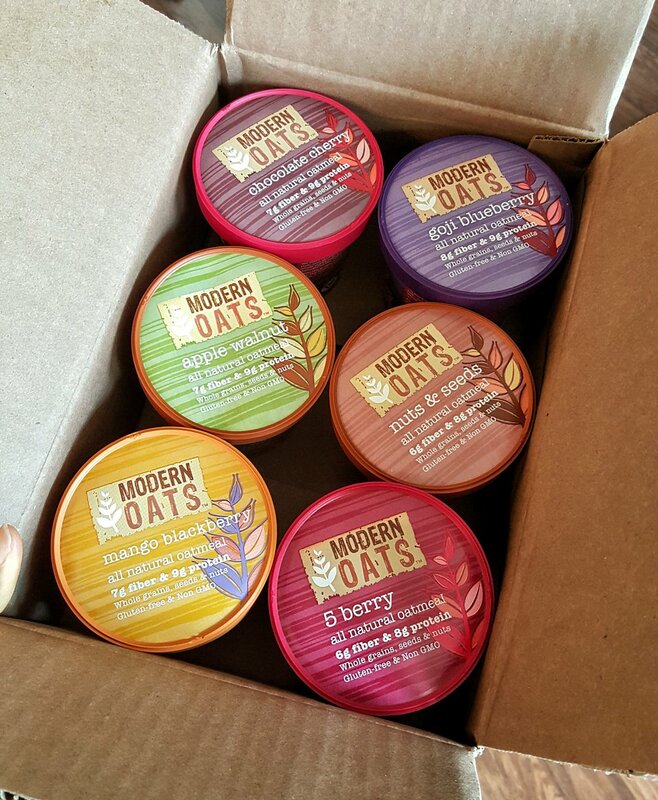 anyway, if you'd like your very own Modern Oats variety pack, you can order them right here via my FFL Store! we did a Modern Oats Periscope yesterday too; check it out via katch.me along with all my other past scopes if you're interested. Q: you're rushing outta the house and have not eaten breakfast yet.... what do you do? be honest!